Most really good things in life will thrill you to start with, but then your enthusiasm will go down over time. I’ve heard food experts talking about how “the banquet is in the first bite”. They say only oysters give you a better taste with every new one you eat. Staff at SCIL seems to be in a constant good mood. 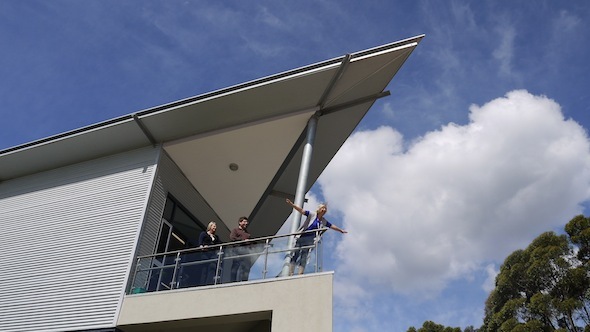 Okay, let’s first discount the fact that they are Aussies, having their school in a setting in Terrey Hills that at first glance looks like a holiday resort. But it’s more than that: This school has a Christian background. It's been explained to me that "caring for each other is within the DNA”. They shared these values years before in a “normal” setting with classrooms. 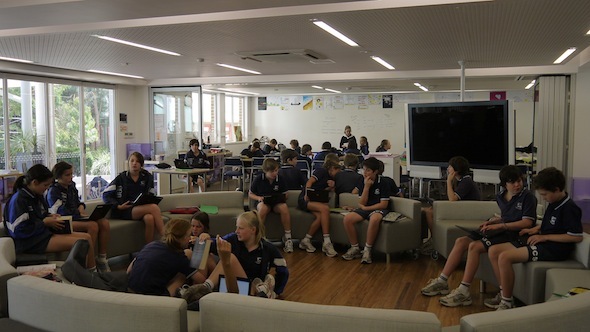 Now for the teachers and students working in open spaces (“the Zone”) good, trustworthy and caring relationships are the magic that makes learning there better than before, and the noise level never goes up too much, like it does in normal schools. 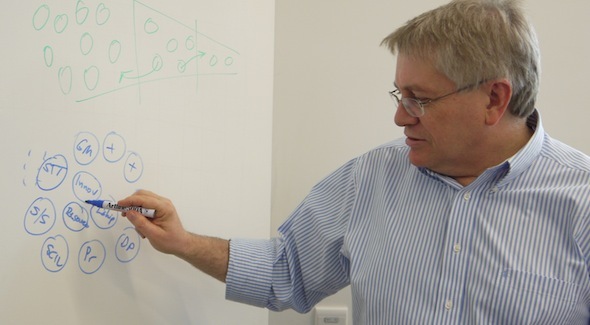 The school’s principal Stephen Harris is often asked to explain the structure of NBCS and SCIL and its organizational chart. Happily he jumps to his Idea Paint wall and starts to draw circles, not the usual pyramids structure. He puts the vision and values of the school in the center and around them the different key players, including him as the master visionary. Stephen thinks that persons and positions are the wheels which give the vision energy. While he perceives himself as a “wheel”, he leads cooperatively without bossing around. We came to test some playDUcation missions and quests. This School is already highly gamified! 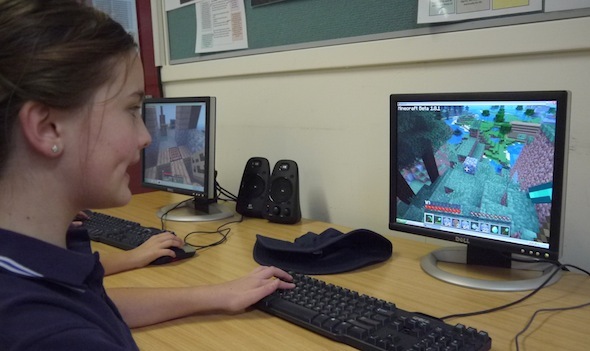 Steve Collins explained and showed me how the school makes time for students to play Minecraft online, in earlier times they used to go to Second Life. Playing games and reflecting on their strategies, collaboration and outcomes contributes to learning. With Lou Deibe’s 5th grade class we found wonderful special agents with very special skills to solve a special secret task connected to a great woman pharaoh of Ancient Egypt. The smartness, perseverance and collaboration skills of the designated teams were stunning! They took each challenge with joy and curiosity. They solved all tasks, and we had a great time. It did not feel like learning. Their motivation was stunning - during the last days of school after all tests had been taken. But the most surprising and amazing test result we had was with a group of ten students Mark Burgess picked from 8th grade. 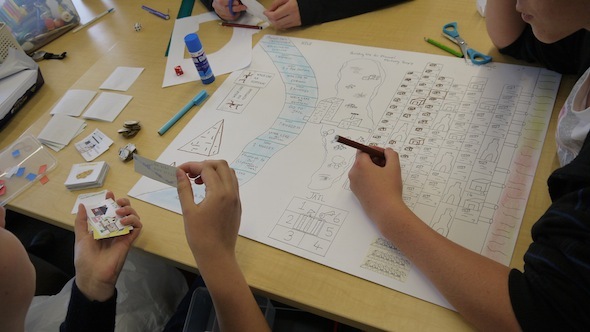 We gave them a very hard task: They became game designers and their mission was to reconstruct a lost board game that people used to play to understand Ancient Egypt. We actually didn’t think it would work, but Mark encouraged us to try. He said that SCIL had a culture of “safe failing”. And because we all tried, we got the most amazing output ever: The two teams of students worked voluntary at home until late at night and came up with complete board games with great solutions for the game’s strategy and extremely creative designs! 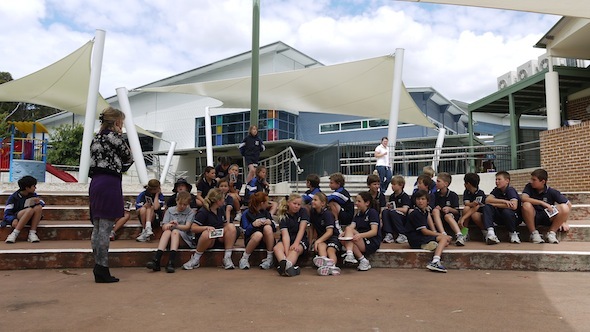 While there is so much talk about integration, this school lives it. I met Daniel, a 15-year-old boy who goes miles beyond his learning (despite being in a wheelchair and fighting the dis-coordination of his body) to save the orangutans in Borneo. He’s raised more than $ 600.000 and now goes for the million. I meet so many examples where trust and caring have changed trajectories, discovered potential instead of sorting out people. After this second visit I trust even more that this school and its core, the Sidney Center for Innovation in Learning, SCIL, are going to continue to inspire and create the future of education with more engaged young people, happier teachers, stronger values and culture, improved learning and better results. Way to go.